No, it’s not an escape room (Pour Sports Bar and Grill) and it isn’t incredible barbecued meats (The Pit Stop Bar and BBQ Grill). What differentiates Gator’s from all other sports bars is its sauce. Gator Sauce is a savory, mustard based sauce made fresh on site with all natural vegetarian ingredients. It comes in three flavors according to hotness; Medium; Hot; and TermiGator. The sauce is best on “Gator Balls” and “Gator Wings”, but it is also infused with the pizza sauce Gator’s uses on its delicious oven baked pizzas. In a world chock-full of sports bars, it is something as simple as a signature sauce that can make a sports bar a “destination”. As for the rest of Gator’s menu, one can choose between numerous appetizer choices, previously mentioned oven baked pizzas, or a myriad of other distinctive options. Gator’s also caters to people looking for daily deals by offering a different beer, liquor, and food item at a reduced cost every day. There is ample seating in Gator’s open floor plan as well as bar seating. There’s also a lounge area cornered by a cozy fireplace. 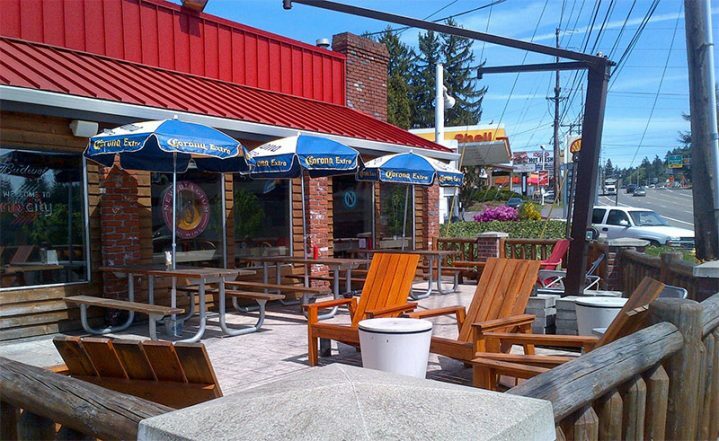 When better weather returns, Gator’s has a large patio in which to enjoy libations while watching the commuters on Pacific Highway go by. Entertainment at Gator’s Pub and Eatery is abundant and fun. Video poker and Keno, two pools tables, and board games can be enjoyed while viewing sports on any of the 16 flat screens. Gator’s has also accommodated the karaoke fan by offering nightly karaoke on an actual stage adorned with two large TV’s and a professional sound system in which to experience the karaoke performers. As for beer selection, Gator’s has 16 taps, three of which are seasonal rotators making sure to provide variety for the biggest beer connoisseurs. Gator’s also has a fully stocked cocktail bar and knowledgeable bar tenders and staff (many of which have been at Gator’s since its inception in 2002) who can satisfy any drinker’s palate. Located on Pacific Highway, Gator’s is easily accessed from I-5 and Highway 217. Gator’s Pub and Eatery also offers a free app which has information about its menu, upcoming events, and directions to the bar. Gator’s has made it all too easy for anyone looking to enjoy great food and drinks in a warm atmosphere as well as some top-notch Gator Sauce.